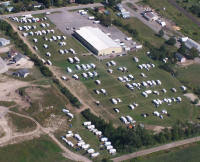 The grounds around the Keeler Centre are all grass and large enough to provide camping for up to 300 campers. With a weekend pass camping can be provided, although there are no camping charges, a $15.00 fee is charged per site to cover insurance, port-a-potties and general maintenance to the grounds to prepare for the weekend. All sites are numbered and campers may pre-register their same site annually up to a deadline, then it becomes first come, first served. All campers must be registered with the Apple Country Jamboree committee – one camper per site. No registration is confirmed until fees are paid in full. Sites and / or campers can only be transferred from one location to another by the committee. All tents will be in a designated area. Generators are allowed to run ONLY between 8 a.m. to 9 p.m. for 2 hour continuous time maximum. All pets must be on a leash at all times and in the control of their owner per Municipal By-laws. No pets are allowed inside the building and the owner is responsible for clean up. No campfires in accordance with local By-laws. No electrified instruments or sound equipment allowed in camping area. Wrist bands must be worn at all times to enter and while inside the building. Alcoholic beverages allowed on your campsite only. No beverages to be taken in or out of the facility. Strictly enforced under L.L.B.O. regulations. One vehicle per campsite is permitted with your trailer. An area will be designated for Motor Home towing vehicles also for anyone who has a second vehicle. NO recording / videotaping of the main stage shows with any device. High back lawn chairs can only be placed against the boards in the Keeler Centre to view the shows. The Apple Country Jamboree Committee and the Keeler Centre will not be responsible for lost, stolen or damaged articles / property. The Apple Country Jamboree Committee reserves the right to reject, remove or revoke access to the property for the Jamboree weekend. Current camping spots will be held only until December 1, 2019 for registration to the 2020 Jamboree (excluding the entertainers' area) or specific circumstances. Starting December 2, 2019 camping sites will be on a first come first serve basis. Reserved Seating: Seats cannot be saved all afternoon unoccupied for the main show at night. All seats reserved for the main stage show must be occupied prior to start of show or they will be declared available for anyone. The above is responding to the requests by you our valued customers and the arena staff who we try to work closely with. As mentioned above, a section of the floor has been reserved for people who wish to sit on their lawn chair (no high backs).